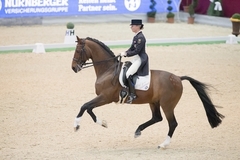 Eichendorf took second place twice in the Special Tour of the CDI4* of Graz. After a longer show pause, our good boy got off to a great start this season. In the Grand Prix qualifier for the Special he had many highlights that the judges rewarded with 72.34 percent. In the Special he achieved 72.15 percent which meant second place which pleased me very much. Dorothee Schneider/GER won both tests on UllrichEquine’s St. Emilion. In the Special, third, fourth and fifth places also went to Austrian riders: Astrid Neumayer with Rodriguez, Amanda Hartung with Wolkenritter and Martin Hauptmann on Fechdachs H.